Every week we read that yet another major housing project has been turned down by the Courts here in New Zealand because of the need to protect "rural character" or "natural landscapes". This may well have profound short and long-term consequences for the future of our middle class, as it does for the same class in countries around the advanced world. Every week a multitude of smaller developers abandon their projects because Councils’ compliance costs and development contributions make the projects unviable – even if the land were free. And it’s not. While the public awaits the National-led government to release its foreshore and seabed bill on September 7, it is worth looking at some signs of things to come. 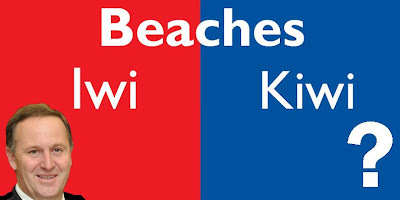 Practices in place at present concerning unwonted coastal Maori tribal influence over the foreshore and seabed are likely to multiply exponentially under the impending legislation. This increase can only result in the further undermining and overruling of New Zealand’s open, secular, democratic Western society, and in particular its scientific culture. Destruction of the supremacy of Western civilisation in New Zealand is of course a key objective in the Maorification agenda being pandered to by the government’s foreshore and seabed legislation proposals. I write this week’s commentary in partial defence of my last article in which I argued that teacher recruitment and training should become the responsibility of schools. Schools should be able to recruit their new teachers direct from university graduates without a course of teacher training having to intervene first. Ron Smith: What to do with the prisoners? We seem to be agonising once again over captives in the ‘war on terror’ and, particularly, over prisoners taken as part of the Afghan counter-insurgency. Of course, it goes without saying that we have an obligation to treat captives humanely. This derives from general principles which require us to treat all human beings as part of a single moral community, even if they do not appear to reciprocate. More directly, the obligation comes from our membership of the United Nations (and the associated Declaration of Human Rights) and, more specifically, to our commitment to the various Geneva Conventions. John Maynard Keynes once wrote: “There is no harm in being sometimes wrong – especially if one is promptly found out.” Unfortunately for the world, the problems with Keynes’ ideas were not discovered promptly, and the lessons were too soon forgotten as Keynesian thinking enjoyed a revival with the recent global financial crisis and subsequent recession. For the first time, an American diplomatic representative was present in Hiroshima at this year’s remembrance of the dropping of the first atomic bomb on that city. It was said that this was intended to reflect a common United States / Japanese commitment to the abolition of nuclear weapons. The American representative did not apologise for the event, although the United States is regularly urged to do so and the question is still live in the context of a projected visit by President Obama to Japan next year and the possibility that he may visit Hiroshima. “Let me tell you about economists, in particular those we hear on the radio and on television and read in the newspapers. They are fundamentally, intellectually dishonest. They are not to be trusted because they are deeply compromised. By volume, there are 259 Trillion cubic miles of solid mass with an average temperature of at least 2500F, in planet Earth. There are 310 Million cubic miles of oceans and lakes. This total amount of water is 0.023 percent of the earth’s mass and the total atmosphere is 0.00008 percent of the planet’s mass. Carbon dioxide is then 0.004 percent of the atmosphere and the human caused CO2 is just 0.03 percent of that. The thoughts for this article flashed into my mind when I began a talk at one of the retirement villages that are located in the electorate of Tamaki that I have been elected to represent in Parliament. (Yes, I am an Electorate MP, not a List MP. I put great emphasis on the difference.) I began my talk by paying tribute to a resident of the retirement village who had been a school teacher; in fact who had taught me social studies and geography at Ruapehu College, Ohakune, way back in the 1960s when I was 14/15 years of age. I described him as “a teacher who knew stuff, more than we his pupils (yes we were pupils in those days, not students) knew, who was really interesting to listen to and learn from, and who was superbly well organised”. After completing an interview with Larry Williams last evening I listened in to the talkback response - all in favour of welfare reform - and then caught Wendy Petrie announcing that TV One would also be covering the Welfare Working Group Issues Paper, had talked to a young solo mum and had done some of their own number crunching which might surprise. So I tuned in. They led with the unemployment benefit showing, with graphics, that the duration of stays on it are not that long. Then they interviewed a sweet young mum who studies and has been raising her much loved child on the DPB but is determined to get off it and repay the taxpayer. Hone Harawira’s call to prevent what in the South African Apartheid years was known as “miscegenation” (interbreeding between races) in his family comes two centuries too late. Mixed race sexual relations have been a part of New Zealand life since Captain Cook. Well before the Treaty was signed in 1840, Pakeha whalers, sealers and traders had established liaisons with Maori women resulting in mixed race children. The rush of mostly British settlers after 1840, boosted by Gold Rush immigrants in the 1860s, and Vogel’s immigrants in the 1870s, brought to our shores huge numbers of settlers, many of them unattached young males. Sigh. Just when I was starting to think TV3 News wasn’t so bad after all (a cynic would say it’s because anything looks good alongside their competition), they do their best to drive me away again. Their lead item on Tuesday night was a shocker, though I mean that in the metaphorical rather than the literal sense. Too much negativity about Maori in the news -- a senior lecturer at Auckland University says she wants to hear MORE of “the specific voice of Maori as colonised” in the news rather than that of “a Maori scientist in a news item about wind farms”? As noted earlier in these commentaries, humanitarian restraint in war is governed in its specifics by the universally-agreed provisions of the Geneva Conventions and, most recently, by the statutes of the International Criminal Court (ICC), to which more than 100 states have now bound themselves. In modern practice, the obligations of combatants (and particularly the forces of state parties) are set out in detailed ‘Rules of Engagement’ (ROEs). Unlike the public provisions of humanitarian law (Geneva and the ICC), these rules of engagement are not public documents and therefore the content for any particular engagement can only be deduced from the public pronouncements of those who know. You may have thought Ethics was a county in England, you may have trampled on our free speech in election year, but at least you locked in our right to a free beach. He can't be sure a group of part-Maori, part-Pakeha New Zealanders won't one day tax you for the right to swim, sail or fish in your own bay. The good citizens of Northland have of late been treated with the spectacle of local body politicians and politically engineered council staff, arguing the case for amalgamation of the local councils. Their cause is dissolution of the Northland Regional Council and devolution of its assets to the local councils, but their case is flimsy and self-serving - nothing more than a crude attempt to storm the parapets of the Regional Council and seize the $126 million of assets stashed within its coffers.